The Moto X may have officially been unveiled this past Thursday, but we have yet to hear an official launch date. We were told by Motorola that the device would start to arrive in late August or early September, and that they were leaving specific dates up to their carrier partners. If you can’t wait for those announcements to come or for the end of the month to arrive, ebay is your friend. Listed today, we have a Moto X “prototype” with a “Buy It Now” price of $799.95. Should you choose to fork out the substantially increased-over-retail price, you could have the phone by Tuesday. The seller has a pretty stellar ebay record with over 2200 ratings and a 99.1% positive feedback score, so it looks like this may be legit. They claim that this phone is unlocked, and that it will work on just about any carrier’s network (both CDMA and GSM). However, if you want LTE, you’ll have to use this phone with a Verizon SIM. You won’t complain about that though, will you? Clearly this was a test device, as you can see the “Motorola Confidential Property” and “Not For Sale” branding all over the front. 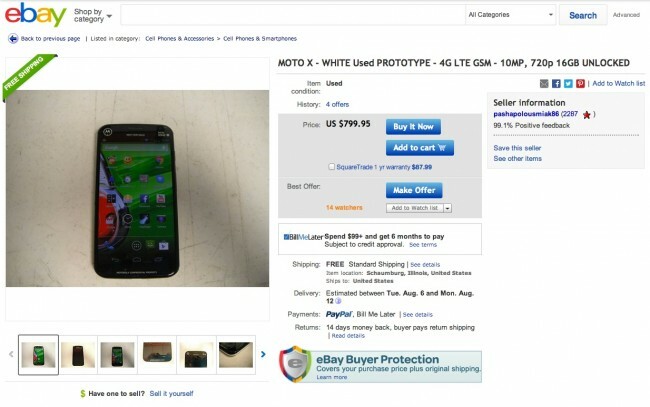 You can even see the serial number listed in the top right corner, so whoever gave this phone up, is not afraid of the wrath that Motorola could potentially bring down upon them. This model has a two-toned color scheme with a white back and black front.